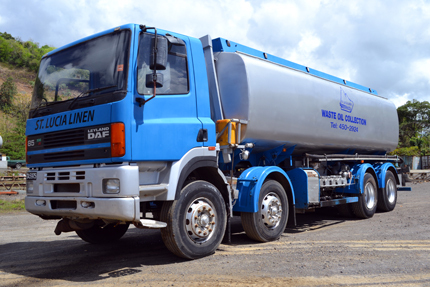 St. Lucia Linen Services Ltd. is authorized by the St. Lucia Solid Waste Management Authority to collect and dispose of all types of waste mineral and vegetable oils. We collect used oil throughout St. Lucia and reprocess it for further use. Our aim is to recover and reuse the maximum amount of waste oil possible, ensuring minimal impact on the environment. All used oil is treated and recycled for use as fuel oil in commercial and industrial applications. Our fleet of specialized waste oil collection vehicles enables us to collect all volumes of waste oil, from a few litres to a 25,000 litre tanker load. Whether you want a regular scheduled pick-up or the flexibility of ordering a pick-up “on call”, you can be assured of an efficient service by our competent trained drivers.